For over thirty years, World War II veteran and author Burt Hall assessed accountability in government and national security. Now, this seasoned, professional analyst delivers a tough account of what went wrong in our politics and system of government over the past two decades and what we can do about it. 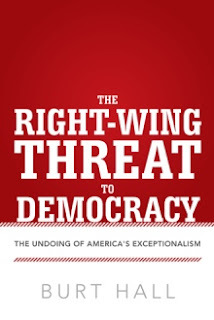 The right wing (not to be confused with Conservatism) has hijacked the Republican Party and wrecked havoc on our nation. It exploited basic flaws in our system to gain power and a series of major setbacks and a weakened democracy have followed. 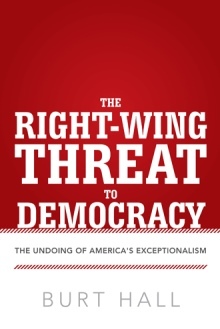 The Right-Wing Threat to Democracy lays out clearly what the basic flaws in our system are and how they can be fixed. The danger is that an ongoing shift of political power to the very wealthy and suppression of voting rights is silencing the voice of the average citizen. If elected officials do not fix the basic flaws, the American people have alternatives in our democracy and must take matters into their own hands. After early careers in the aircraft electronics field and as a CPA, Burt Hall joined the USGovernment Accountability Office (GAO), where he served as group director analyst on national security and other matters. For more than thirty years, he reported to Congress and testified before its committees on behalf of the GAO. Mr. Hall graduated from the Harvard Advanced Management Program and was loaned twice for two years, once to a bipartisan congressional commission and later to the Reagan White House. With Ed Asner, who also contributed to The Right-Wing Threat to Democracy, Hall coauthored Misuse of Power. He coauthored the bestselling book, How the Experts Win at Bridge, with his wife, Lynn.